As readers of this blog know, I strongly encourage players to work on sports psychology. It's amazing how many matches are won or lost on this, and yet after losing a match because of nerves or some related issue, players go and practice the shots they missed when they were nervous rather than address the reason they missed the shots with a dose of sports psychology. Here's a number of resources on sports psychology, including this excellent one. "Have you ever stopped to consider how elite table tennis players deal with the pressure of competition and consistently perform at their best?" That's the opening line of Get Your Game Face On Like the Pros!, the new table tennis sports psychology ebook by Dora Kurimay and Kathy Toon (available at amazon.com). It's 158 pages with lots of useful content. It covers sports psychology specifically for table tennis better than anything else I've read, since most other books are more general, for all sports. It does so not just with theory, but with practical steps to improve your mental game and thereby your overall game. I reviewed an earlier and shorter version of this book, "Get Your Game Face On." This version is greatly expanded, both the text and the title. If you are serious about your table tennis, I strongly encourage you to read this book, and try out the various methods explained for strengthening your mental game. It could pay off dramatically in your performance. Throughout the book there are numerous real-world examples from world-class players. Often I was nodding my head at mental tricks that match what I'd developed over the years, or at recognizing something I'd see others do. The specific breakdown of how you use the time between points - the four R's - especially led to much thought that will influence my own coaching. The book should be a must for table tennis coaches and serious players. Part 3 is mostly new, and covers a wide variety of issues under the general topic of Develop Your Healthy Lifestyle Choices. After more about the Game Face Performance Triangle (Emotional-Physical-Mental), it covers 14 specific topics under three categories. Under Physiological, it has Nutrition, Hydration, and Sleep. Under Physical it has Practice, Conditioning, and Rehearsal (practicing the four R's of your Game Face routine). Under Mental, it has Self-Talk, Focus, and Visualization. Under Daily Life it has Time Management, Academics and Work, Fun, Relationships, and Environments. The book finishes with two more sections, "Where to Go from Here," and a note to coaches, "Hey, Coach, Get Your Game Face On!" It's unfortunate that most coaches don't really focus on sports psychology. There's more to coaching than just technique and tactics. Dora Kurimay was a member of the Hungarian National Table Tennis Team for six years and was six-time National Champion in doubles, singles, and teams. Perhaps more importantly she has a Bachelor's degree in psychology and two Master's degrees, in Psychology and in Sports Psychology. She has a long coaching background as well, both in table tennis and other sports. She now lives in the U.S. and at this writing has a 2380 rating. Kathy Toon coached tennis for twenty-three years, including at the University of California-Berkeley for fourteen years where teams she coached won three national doubles championships. They are taking place right now in Beijing, China, Sept. 6-15. Here's the USATT page and the ITTF page for the event. Here are pictures. Representing USA are Tahl Leibovitz and Sherri Umscheid, with Angie Bengtsson the USA Coach. Tahl made the quarterfinals of Class 9. Here's the video (1:10), with Ma on the far side. Here's a highlights video (5:01) from four years ago that I don’t think I've ever posted. Here's the promotional video (2:49), from the Wilmington TTC in North Carolina. I don't get it. 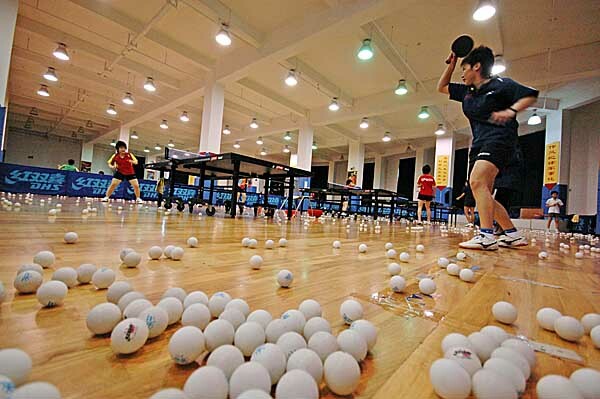 No sport relies more on spin than table tennis. We complain all the time about how spectators don't understand high-level table tennis the way they do other sports because they can't see how much spin players are putting on the ball. We complain all the time over how serves often dominate, with way too many rallies ended by the receiver missing or making a weak return that the server puts away. 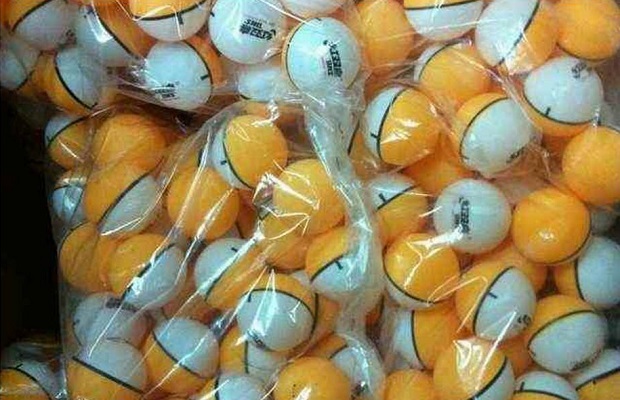 SO WHY DO WE USE ONE-COLORED BALL??? We should be using a multi-color ball so both players and spectators can see the spin. Sure, this would hurt players who rely on disguising spin - but not as much as you'd think, since by the time players read the spin from the ball it will often be too late. It might hurt defensive players, and that's the only reason for any hesitation on such a switch, and why it should be well tested first. But it might not hurt them as much as it might seem, as defensive players will be able to make better serve returns against attacking players. They'll be able to read the serve better, and since defensive players usually take the ball later than others, will have more time to read the service spin from the multi-colored ball than attacking players. Yesterday was Day Three of the five-day camp. The focus was on footwork, pushing, and forehand loop. I was amazed at how quickly most of them picked up looping against backspin as I fed multiball. 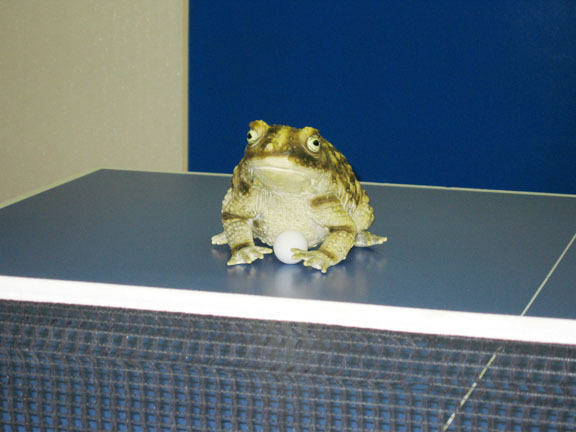 I also introduced them to Froggy, and much target practice ensued. We've started each day with ball bouncing, which is a great way for kids to develop hand-eye coordination and ball control. The record for most bounces in a row at MDTTC is 2316 by Matt Stepanov (now 13, but 11 when he set the record). While he still holds that record, a new camp record was set by 11-year-old Leo Diperna, who did 3363 bounces in a row. We didn't plan on it, he just wanted to go until he missed, and we let him. It took about half an hour. Here's the info page. They will be held Aug. 31 - Sept. 1 (Sun & Mon) in Mississauga, Ontario, Canada. Here's the entry form for this perhaps historic event, the Texas Wesleyan Open, Sept. 20 in Fort Worth, Texas. Here's the video (6:17) of Matt Hetherington's review. Here's the article by Matt Hetherington, which came out this morning. He takes the opposing view on changing to the two-colored ball. Former USATT President Sheri Pittman Cioroslan is doing an article every day during the last 100 days of Adham Sharara's ITTF presidency, counting downwards from 100. Previous ones are linked from the USATT News page, as well as in my past blogs. Seventy-five down, 25 to go! Here's the article that talks about Daniel Radcliffe playing table tennis with Zoe Kazan, his co-star in the new movie "What If," and links to a video (1:46) showing them playing. Will Ping Pong be Included in the Robot Olympics? I've always wanted to put a camera on spectators that shows exactly what they see as they watch a table tennis match. But I'm afraid that most of what we'd see is their eyes focused on the ball as it goes back and forth, with the players themselves slightly blurry images on the side. That's because that's exactly what most spectators are watching when they watch a match. It's almost like self-hypnosis as their eyes go back and forth, Back and Forth, BACK AND FORTH, over and over and over. You might as well just stare at a stationary ball. Another aspect that ball-watching spectators miss is the initial movements on receive. They see the receive, but they don't see the step-ins for short balls, or when the player started to move to receive, and so on. Often receivers start to do one thing, then change as the serve approaches - but you don't see this unless you are focused on the receiver from the start of the point. So if you really want to learn, don't watch the ball. Pick a player and watch him exclusively for a game or so. Then watch the other. You'll learn a lot more this way than by watching the little ball. Let the players do that. Here's the blog entry, with both text and video on the backhand loop. On Monday I linked to the One Energy Commercial (30 sec) that featured Chinese superstars Ma Long, Zhang Jike, Li Xiaoxia and Liu Shiwen playing in neon outfits. Here's the behind the scenes video (2:19) that shows it being put together. 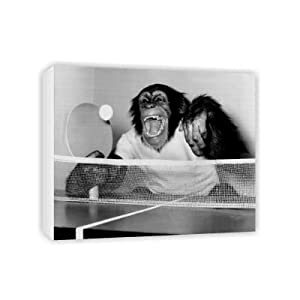 Judah Friedlander Plays Table Tennis in "Teacher's Lounge"
Here's a new picture of a chimpanzee playing table tennis. I don't know if it's real or not. Here's another one. This camp I'm not giving many lectures, as most of the players are locals and we decided to get them out to the tables more quickly rather than have them watch demos and listen to lectures from me that they've all heard before. It's actual a surreal experience not giving these lectures. As always, the players can be divided into three types. There are the goof-offs - the ones who are here strictly for the fun, or because their parents made them, or are just too young to be serious yet, and aren't really interested in learning. They are the hardest to deal with. There are the in-betweens - the ones who do want to learn, sort of, and will do what you ask, but are really counting the minutes until we get to playing games. They're okay to work with, and you push them as hard as you think you can without losing them. And then there are the ones who are determined to get good, and really work at it. They are great to work with. I often surreptitiously give them longer sessions, and sometimes hit with them at the end of a session or even on break. These are the ones who want longer turns at multiball while the others can't wait to finish their turn. They are also the ones who get really good. Here's an interesting question of biology and physics. Did you know that the average mass of a seven-year-old's foot is many thousands of times greater than an adults? It may not seem so until you see the gravitational pull between the bottoms of their feet and any ping-pong balls that lie on the floor, leading to many broken balls. Due to this blog and other writing projects, I've been operating on little sleep this week at camp. I confess I've taken the easy way out. When I take the kids to 7-11 during lunch break I've been buying a Mountain Dew each time. I try to go easy on soft drinks, with a general rule of only drinking them at restaurants and at home when working late at night, but I made an exception here. Hopefully I won't be this exhausted all summer. Aug. 25-29: Rest and Recover!!! Yesterday I linked to the job description and application info for CEO of USA Table Tennis. As I noted the, they have a LOT of requirements!!! One thing that jumped out at me near the end is where it said near the very end under Qualifications, "A genuine passion for the sport of Table Tennis. Exposure to, or involvement in the sport is a plus." If exposure or involvement in the sport is only a "plus," then how could it be required that the person have a "genuine passion for the sport of Table Tennis"? There were a couple of other things that threw me that I won't get into. It said to apply or respond to this opportunity, please visit www.prodigysports.net/search. I visited it, but it was a bad address. However, under it was a link to apply. No, I'm not applying. I don't qualify for much of what is required - I'm not what they are looking for. I blogged about this on March 27 and on May 21. As I wrote in those blogs, I believe we are once again playing the lottery in trying to sell the sport now rather than focusing on the process of developing our sport so we can sell it. (You don't need large sums of money to start this process, as I've pointed out repeatedly.) Maybe we'll get lucky this time, but we've tried this unsuccessful approach for many decades. Playing the lottery can be addictive - instant get rich schemes are always more attractive than doing the hard work in developing the sport. At the end of the application info there's a "Characteristics of the Successful Candidate" section. I decided to grade myself on the ten items. Why not grade yourself as well? Proven success in effectively leading, building, mentoring, managing, motivating, encouraging professional growth of, and delegating to staff. C or Incomplete; I don't have a lot of experience in these areas. Credible, truthful and honest; a person of high integrity. Able to express themselves frankly but with respect. Conflict resolution and sound decision-making skills critical. I would hope I get an A here. Experience in planning and executing fundraising activities in non-profit and/or amateur sports organizations. Track record of growing revenue and creating progressive, stable and sustainable funding sources. C or Incomplete; not a lot of experience here. A self-starter able to independently assess or enhance existing programs as well as initiate new programs as needed. A; this pretty much defines much of what I do. Skilled written and verbal communicator on all levels along with ability to liaise with Board of Directors, the USOC, and other organizations within and related to the sport. Easy A for me here! Ability to initiate, develop, and maintain favorable relationships with athletes, volunteers, parents, officials, sponsors, members, other related organizations, such as the ITTF, and the United States Olympic Committee. I think I'd get an A here as well. Knowledge and skill to manage a budget effectively. Another A. Besides a bachelors in math, I was familiar with the USATT budget for years. I don't know advanced accounting systems, but that's not needed - we have accountants for that. Ability to successfully negotiate contracts. D; I'm not that good a negotiator. I hate haggling. I used to bring in record advertising when I was editor of USATT Magazine, but I sold the ads based on the strong content and timeliness of the magazine, not by salesmanship. Organizational competence and multitasking proficiency. Tested business savvy coupled with strong people skills. C+. When I put aside my idealistic side, I have pretty good business savvy, other than my weak negotiating skills. My people skills are pretty good via email, not so good in person, especially with strangers. Here's a new coaching article by Ben Larcombe at about.com. Yes, at about.com - the table tennis site there is back up, but I don't see the forum yet. Here's the new coaching article by Matt Hetherington. Here's the video (33 sec) - it's a great and fun way to develop quick feet! It's official - it'll be held in Las Vegas, Dec. 16-20. It now shows up in the USATT Tournament listing. Former USATT President Sheri Pittman Cioroslan is doing an article every day during the last 100 days of Adham Sharara's ITTF presidency, counting downwards from 100. Previous ones are linked from the USATT News page, as well as in my past blogs. Twenty-seven down, 73 to go! 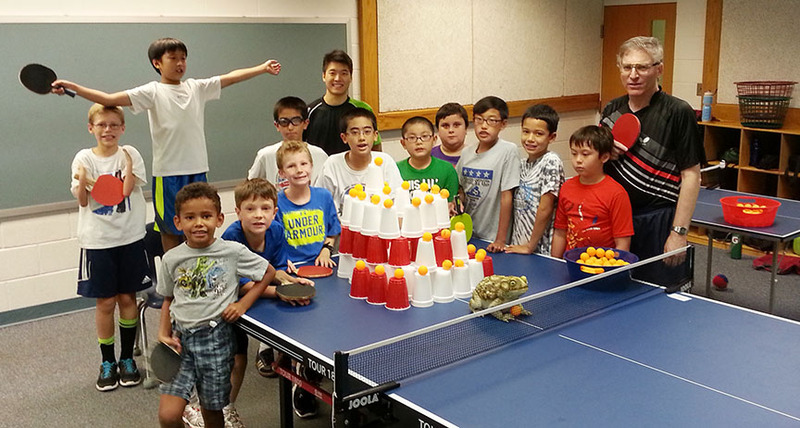 Just thought I'd give a shout-out to their Table Tennis in Schools Program, which is especially helpful for teaching groups of younger kids. Recently I was looking for more table tennis type games kids in the 6-8 age range could play, and copied a few of the ones they have in their manual in section four, "Activity Cards." Here's the article, where they show how a picture of Obama playing table tennis with English Prime Minister David Cameron has become a hit with online memes. I'm not sure if I linked to all four of these animated table tennis cartoons before, so there they are. Each episode is exactly 23:07. I haven't watched them yet - I may do so tonight. Can anyone tell us about them in the comments below? Here's the article and pictures - yes, the guy rallied off oncoming cars and trucks! The Point's Not Over Until It's Over! This type of thing happens all the time. Over the years I've played many dozens of points where my opponent thought the point was over, and so wasn't ready when I'd make a last-minute lunging return. (Alas, it's happened to me a few times as well.) Players often way under-estimate how fast a player can cover the wide corners. (This is one reason why choppers often do well - opponents keep going to the "open" corners instead of attacking the vulnerable middle.) And in our practice games after our session was over, I had at least one point where I blocked a "winner" to Matt's wide forehand and stood up straight, only to be caught when he somehow ran it down and fished it back, forcing me into an awkward block. When I coach, it also happens all the time - primarily because of my tendency to volley balls that are off the end to keep the rally going, or even to play balls after they hit the floor. My students are often caught off guard by this, though they soon learn to be ready no matter what. As I often say, "Just because the point is over doesn't mean the point is over." So it's extremely important to expect every ball to come back until the point is actually over. This means no standing up straight in the middle of a point - stay down in your ready position. Desperation returns happen all the time, and they are usually weak returns that are easily put away - but they are often missed by the unready. I think the most famous (infamous?) case of a player not realizing the ball was still in play was in the final of the New Jersey Open (or was it the Eastern Open? ), circa 1978, between Mike Bush and Rutledge Barry (about age 15, battling with Eric Boggan for the #1 rank among USA juniors), with the score (predictably!) deuce in the fifth. (Games were to 21 back then, so it had been a marathon match.) I was on the sidelines watching when the following happened. Bush was lobbing, and after the lefty Rutledge creamed one, Bush did a lunging, desperation lob, extremely high but way off the end - in fact, I think it was still rising when it crossed Rutledge's side of the table. Rutledge turned his back on the table and yelled in celebration - he thought he had match point. What he didn't see, but what we saw from the stands, was the ball change directions as it neared a fan in the ceiling. The fan blew the ball straight backwards, so the ball landed on Rutledge's side of the table, and bounced back to Mike's, hitting his side before going off the end. So whose point was it? The rules say that the rally shall be a let "…because the conditions of play are disturbed in a way which could affect the outcome of the rally." But the fan had been there at the start of the rally, and so wasn't a "disturbance." And so the umpire (after consulting with the referee) ruled that the ball was still in play, and so Mike's lob, despite its essentially 90 degree turn in mid-air, was a point-winning "ace"! Rutledge was not happy, especially as Mike won the next point and the championship. The first event of the ITTF Legends Tour was held last night, with Jan-Ove Waldner defeating Jean-Michel Saive in the final, 3-2. Here's video of the entire night (about three hours), showing all five matches. Here are pictures from the event. Here's the home page for the event (strangely, no results are given other than the final), and here's the Facebook page. Here are the results. Final: Jan-Ove Waldner (SWE) d. Jean-Michel Saive (BEL), 3-2; SF: Waldner d. Jorgen Persson (SWE), 3-1; Saive d. Jiang Jialiang (CHN), 3-0; QF: Saive d. Jean-Philippe Gatien (FRA), 3-0; Persson d. Mikael Appelgren (SWE), 3-0; Waldner & Jiang byes. Here's one interesting picture, showing Saive receiving serve. Note how far he is around his backhand corner? This is sort of a dying art, the all-out forehand receive of serve. These days players mostly favor backhand receive against short serves. Players like Saive (and often me many years ago) focused on returning essentially all serves with their forehand, even short ones, which they'd flip with the forehand, even if the serve was short to the backhand. "I Wanted to Remind the World That I'm Number One"
Here's the article about why Xu Xin pointed to his player number (where his player number was #1) after winning against Germany's Patrick Franziska, with the two playing in the #3 spot (and so only playing one match, while the top two players would play two each if the team match went five). Here's a picture of the Chinese Team reacting during the Men's Team Final at the Worlds. Note Zhang Jike (reigning World and Olympic Men's Singles Champion) on the far left - he's just lost to Germany's Dimitrij Ovtcharov. Here's an interview with Zhang (2:10) after the team match (through an interpreter). A total of 178,527 points were played. Just thought you should know. Here's the article by Matt Hetherington. This is in regard to changes made by the ITTF discussed in this article and this ITTF Press Release, which I linked to on Monday. Here are two more follow-up articles by Barbara Wei on the St. Louis Open held this past weekend. Other articles were linked to in my May 5 blog (Monday). Here's the video (3:44), created by Jim Butler. Here it is. This could inspire a table tennis fantasy story I may write, involving black magic to create the perfect paddle, etc.